Show the leading social share buttons on any page or post on your site and let your visitors spread the work for you. Can I use Social Share Buttons on more than 1 domain? 2. You can buy the Pro plan that includes licenses for 5 domains, or the Agency plan that includes licenses for 25 domains. How long is my paid Social Share Buttons license valid for? Once you purchase any paid plan of Social Share Buttons, you can use it forever. Support and updates are available for 1 year. You can renew your license each year to get another year of support and updates. Will Soical Share Buttons stop working if I don’t renew my license? 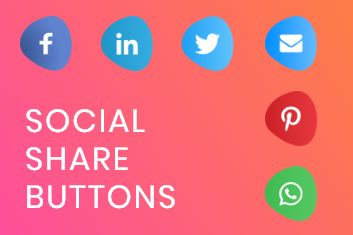 Your Social Share Buttons plugin and all your settings will continue to work as before; however, you will no longer receive plugin updates including feature additions, improvements, and support. Basic templates and customization features.